Carpenter bees are a variety of bee that is so named for their nesting behavior as they are known to burrow into wood or other hard plant surfaces and make nests in these boreholes. Most species in the carpenter bee genus look similar to a typical bumblebee but are mostly or all-black in their coloring. There are two well-known varieties of carpenter bees, small and large. When it comes to life and development, both go through complete metamorphosis which means that they start as eggs then change into grubs, then cocoons, and eventually adults. Carpenter bees are solitary creatures, which means that they don’t organize into colonies. 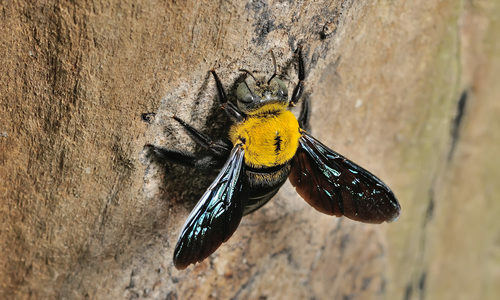 Carpenter bees are capable of stinging, but only females, and they don’t often go out of their way to sting unless they’ve been frightened or provoked. There is nothing especially special about carpenter bee stings and their stings should be treated like any other variety of bee sting you may encounter (of course, if allergic, immediate medical attention is necessary). The main danger they cause is from the destruction of any wood they come in contact with. They enjoy consuming unfinished wood and boring holes in any they can find to lay eggs, hatch larvae, and eat. This means that if carpenter bees decide to make a nest in your home, you will have a lot of holes, buzzing, and general trouble to deal with. Why do I have carpenter bees? While it may be easy to assume that carpenter bees would eat wood, they actually don’t. They enjoy consuming pollen and nectar and consider wood, especially kinds like doors, window sills, eaves, railings, decks, and lawn furniture to be prime places to bore holes and build nests. If you have a home with decent amounts of untreated wood like pine, fir, cypress, oak, and redwood, then that’s a very likely draw for carpenter bees, as they are their favorite varieties. How can I prevent carpenter bees? Keep an eye out for the previously listed varieties of wood that we’ve mentioned and, if you have any in your home or on your property, make sure that none of them are left unfinished. If you see their boreholes, you can create temporary barriers by filling them with steel wool to block their re-entry until you can get a professional pest-removal service to come and permanently clear them out. How can Gregory Pest remove carpenter bees from my home or business? Gregory Pest controls carpenter bee populations by initially sending a professional to come to your home or business and conduct a thorough inspection. During this initial inspection, the technician will accurately identify the variety and location of bees that have made their nests and, in turn, develop a customized treatment plan. The approach we take to the elimination of carpenter bees is determined by your technician on site at the time of inspection. Once they’re eliminated, you as the homeowner can go back to the carpenter bee drill holes and then seal and repaint any holes they made. 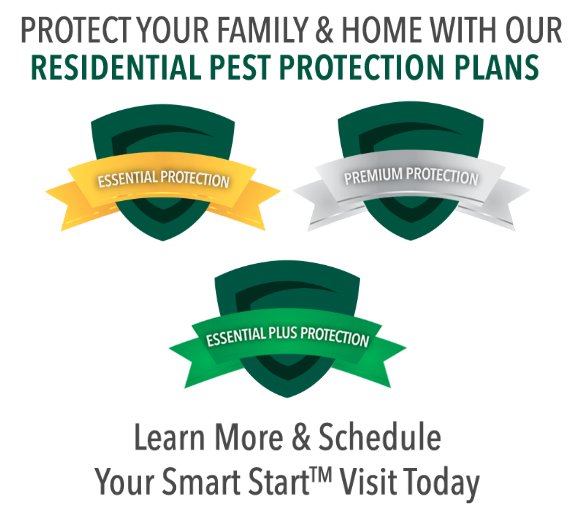 As a homeowner there are also techniques that can control populations without the use of insecticides, including the updating of any unfinished, weathered, or exposed wood surfaces with paint and poly so that the bees are not drawn to them any longer.